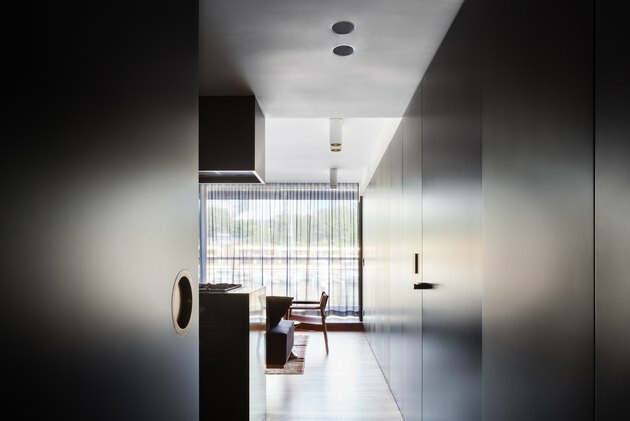 When the team at Architect Prineas, an Australian–based firm led by Eva-Marie Prineas, was hired to renovate an apartment within the Woolloomooloo Finger Wharf (yes, this is a real place) on Sydney Harbour, they knew they had their work cut out for them. The apartment had low ceilings, spaces that felt unconnected to the magnificent views, and bland architecture. Even more complicated: The building is heritage-listed, so there were strict requirements the firm had to follow, particularly in terms of the facade. 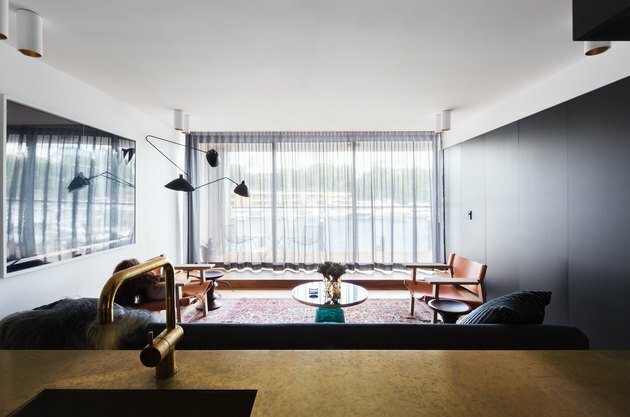 The team reconfigured the interiors, taking cues from luxury hotel design and hiding the private areas — the bedroom, bathroom, and storage — behind dramatic sliding walls. The panels fold flush, creating a flexible layout that can feel larger and more open, or more intimate, depending on the mood. A new timber platform extends into the apartment, helping to connect the living area and the balcony. The finished product is the perfect getaway, with all the luxury and glamour of a hotel and all the comforts of home. The open living room flows into the balcony and kitchen. A Serge Mouille Lampadaire floor lamp adds a sculptural touch to the space and complements the black wall paneling and artwork by Mike Stacey. The balcony's sliding glass doors were replaced and reconfigured. A Tio table and lounge chairs from Mass Productions provide a spot to take in the views from the balcony. One of the panels slides open to reveal an entrance to the bedroom. 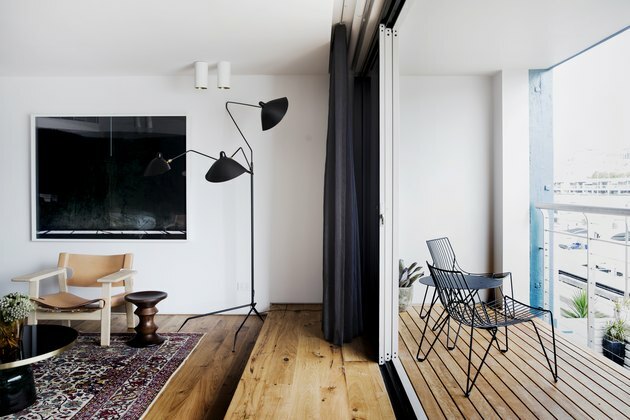 An Eames stool sits between the Børge Mogensen Spanish chair and a sofa from Great Dane Furniture. 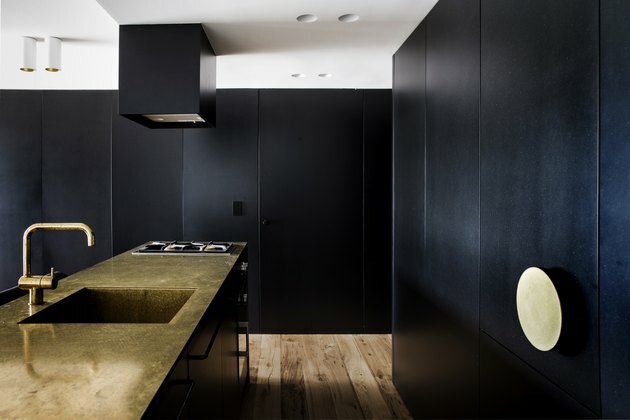 The architects used brass accents like a kitchen counter and oversized door handles to offset the black surfaces. 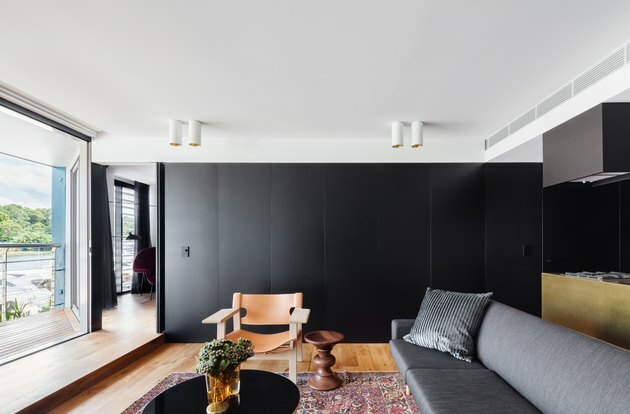 The black panels were designed to be ambiguous — each could be a door or a wall — creating a sense of surprise and discovery for the owners and their guests. The bedroom connects the living room and the balcony. 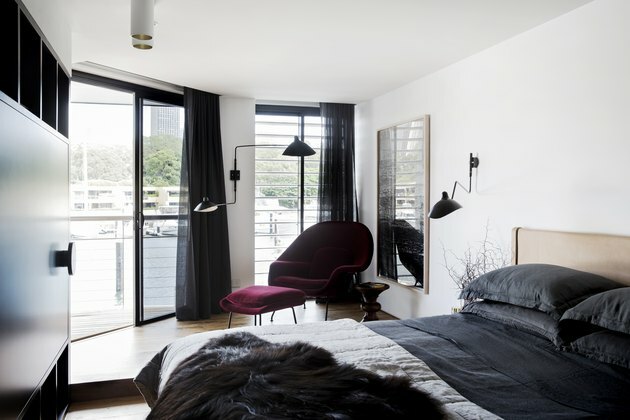 The space is outfitted with a Finley bed by Jardan, Serge Mouille wall lights, and a Saarinen Womb chair. A television is hidden behind the panel opposite the bed. A wall panel slides open to reveal the wet room. The wet room is lined with Artedomus carrara marble mosaic tiles. 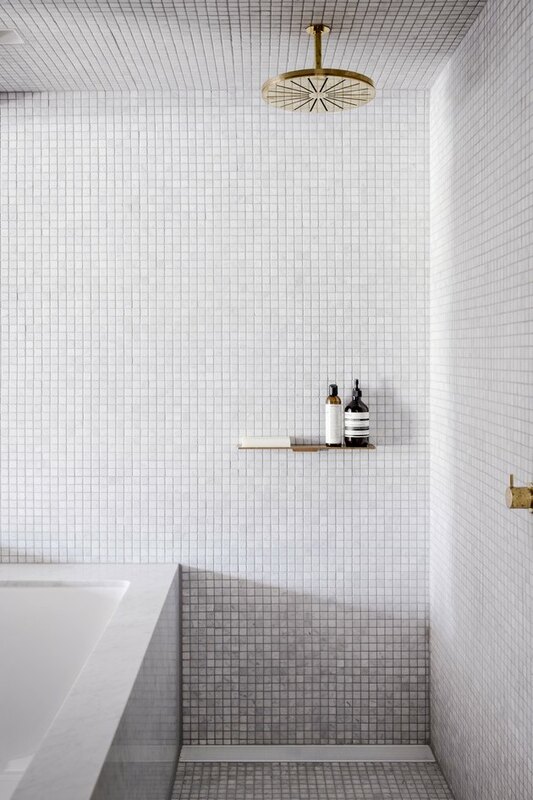 The architects also incorporated brass accents including a Vola showerhead and shelf by Rogerseller. 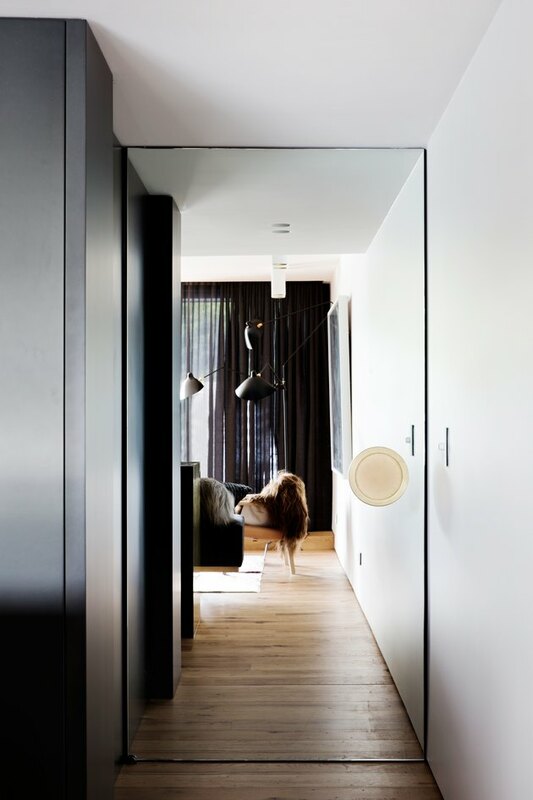 A mirrored wall panel opens to the second bedroom, which used to be a dark media room.